Will is the Cub Scout committee chairperson in our neighborhood. This past month the pack meeting theme was "Abracadabra". Will put on an awesome magician costume and gave the group a juggling lesson. It was great fun. Our niece, Lily Heath, had her second birthday recently. We went to a birthday party that included volcanoes, bubbles and pinatas. Basically the most awesome Lily party ever. Lily insisted that she have birthday hats at her party. Cynthia found out that the old-fashioned cone hats only seem to come in boy themes, so she got paper tiaras instead. I deeply regret not having a picture of Will in his tiara. Lily got a bubble maker from Grandpa Heath and Aunt Becky. She was more excited about running the thing than she was about popping the gazillion bubbles that filled the room. Lily had a way cute castle cake. Here she is eating the roof of a tower. Click here to see more birthday pictures. We are so excited to be having a girl. I've spoken to a lot of mothers-to-be (it happens automatically when you go to church with married students from BYU) and heard arguments for and against finding out what a baby's gender is. I decided I wanted to know and you know what? I love knowing. Sometimes it puts me into fits of excitement. 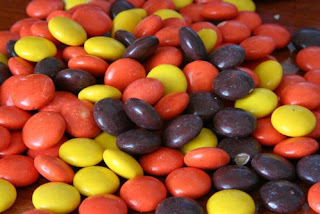 Okay, so the Reese's Pieces theme: Her name is Reese. Will likes to call her "Reesy-piecy" and I like to substitute the words "My little Reesy Cup" in the song "My Little Butter Cup" (Made famous by the Three Amigos movie). I know that ultrasounds are not all that flattering, and I didn't even like looking at them before I got pregnant, but here they are anyway just in case anyone cares. 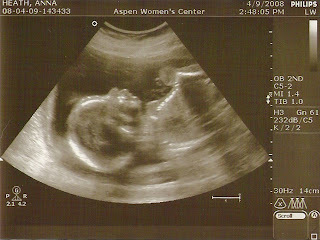 She tried crossing her legs at the beginning of the ultrasound session, but we fruitfully persevered. 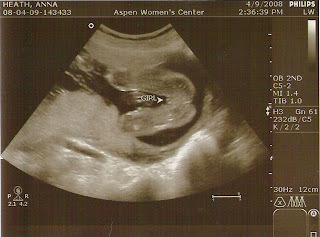 I was so excited after the ultrasound that I had to go do something definitely baby-ish. 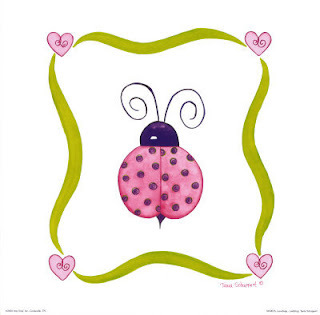 I therefore went to register for baby stuff and decided that Reese's room will be red and green, and I love ladybug anything. The beginnings of a Reesy Bump. Actually, the content of today's blog is old news, but I finally just found and plugged in the chord to my digital camera and had pictures to share. Unfortunately, I lost some pictures, but I still have some to share. Will decided that he wanted to buzz his head. He had let his hair grow out a little longer than usual and was sick of it. He got a major kick out of it mostly because I didn't beleive that he would actually do it. But he did, and I had the pictures to prove it- But I don't anymore, so you'll just have to believe me. After he got his hair cut, I got jealous. I decided to take my hair to the chopping block, too. I do have pictures of my less than six month hairstyle progression. And yes, I do like my short hair. Got sick of the limp, straight hair. 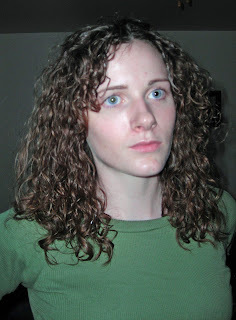 Thought curly hair would add some volume. Got over the curly hair, decided to go with the pixie hair.